The Scotiabank World Cup of Hockey Fan Village will salute members of Canada’s 2016 Olympic team followed by a live performance from Grammy® Award-winning rock band Green Day. TORONTO (Sept. 2, 2016) – The Scotiabank World Cup of Hockey Fan Village in downtown Toronto’s historic Distillery District will salute members of Canada’s 2016 Olympic team followed by a live performance from Rock and Roll Hall of Fame inductees and Grammy® Award-winning rock band Green Day on Friday, Sept. 23 at 6:30 p.m. Tickets to the World Cup of Hockey Celebration of Champions featuring Green Day will be available for purchase via www.Ticketmaster.ca, the official ticket marketplace of the NHL®, beginning at 10 a.m. ET on Thursday, Sept. 8. The show will mark Green Day’s first live date in Canada of 2016. Tickets to the Sept. 23 event will be $25 CAD for general admission standing room. Pricing includes HST. Additional fees may apply. East Fan Village will open at 3 p.m. on Sept. 23 with a paid ticket required for entry and valid only for the day. All attractions inside East Fan Village will be included in the price of admission. Distillery Fan Village will be free and open to the public. 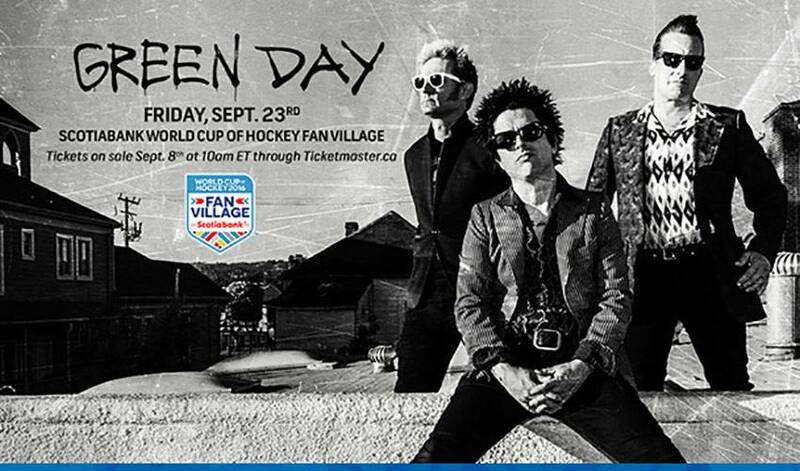 The Sept. 23 celebration will begin with a special welcome to members of Canada’s 2016 Olympic team and culminate with a 6:30 p.m. performance by Green Day in the East Fan Village as part of the Scotiabank World Cup of Hockey Fan Village, a 10-day fan festival at the historic Distillery District. From Sept.16 to Sept. 25, the family-friendly festival will occupy the Distillery District – renamed ‘Distillery Fan Village’ for the 10 days - plus more than 200,000 square feet of an untouched lot east of Cherry Street, which will be known as the ‘East Fan Village.’ The Scotiabank World Cup of Hockey Fan Village will celebrate not only the sport of hockey but the food, music and culture of all participating hockey nations and will feature a diverse mix of programming, designed for fans of all ages, including live musical performances, big-ticket prizes and giveaways, and viewing parties for every World Cup of Hockey game broadcast live on giant video screens. Distillery Fan Village will be free and open to the public Sept. 17-25. East Fan Village will be free and open to the public Sept. 17-22 and Sept. 24-25. On Sept. 16, a paid ticket will be required for entry into East Fan Village for a premium concert. Green Day has won five Grammy® Awards: Best Rock Album twice for their albums American Idiot and 21st Century Breakdown, Record of the Year for “Boulevard of Broken Dreams,” Best Musical Show Album for American Idiot: The Original Broadway Cast Recording,and Best Alternative Music Performance for Dookie. The band was inducted into the Rock and Roll Hall of Fame in 2015 in what was their first year of eligibility for induction. Last week, Green Day released a new single, “Bang, Bang,” from their upcoming album, Revolution Radio due out Oct. 7. The song has already become a #1 rock radio hit in Canada, where the band has sold over two million albums in their career. The band’s Fan Village performance will be the first date on their new fall tour. For information on Scotiabank World Cup of Hockey Fan Village, visit wch2016.com/fanvillage. Fans can join the conversation by using the official hashtag #WCH2016.